If I had to choose what question we are most often asked, it would be something along the lines of “Can you recommend a game for my <insert age younger than 12> year old child?”. We could always take the easy route and choose a classic game like Crossfire or UNO. 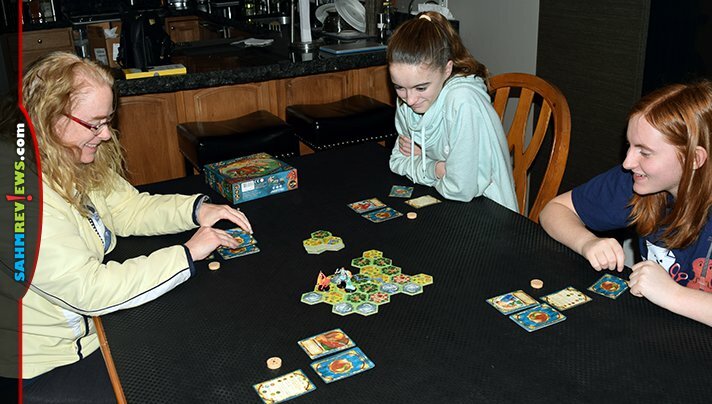 Instead, we choose to introduce their entire family to the wonderful world of modern board games by suggesting My Little Scythe, Ticket to Ride: First Journey, The Siblings Trouble or one of the many junior-themed board games on the market. 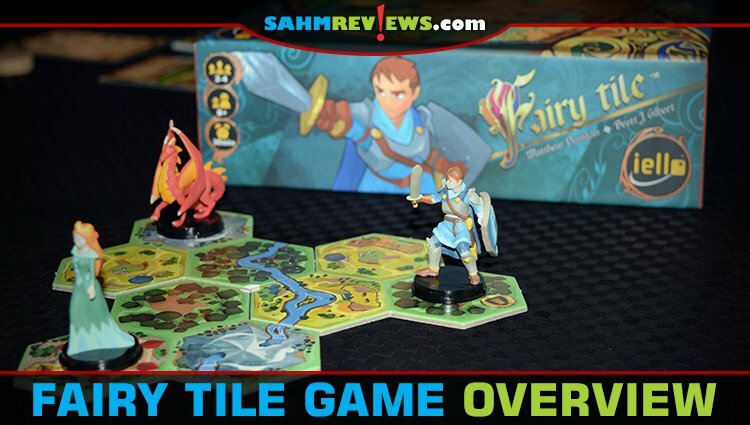 We recently came across a new game by iello called Fairy Tile that will fit squarely into our recommendation queue. It’s part modern board game with its tile-laying mechanic and part story-telling session since it generates a unique story to read every time you play! Designed for 2-4 players aged 8+, Fairy Tile can be played in just 30 minutes – the perfect length for young ones with shorter attention spans! The game has a cute backstory to go along with the game. Fairy Tile is a kingdom of magical lands where a princess, knight and dragon all roam, looking for adventure. They are new to the area and need your help to discover the kingdom! 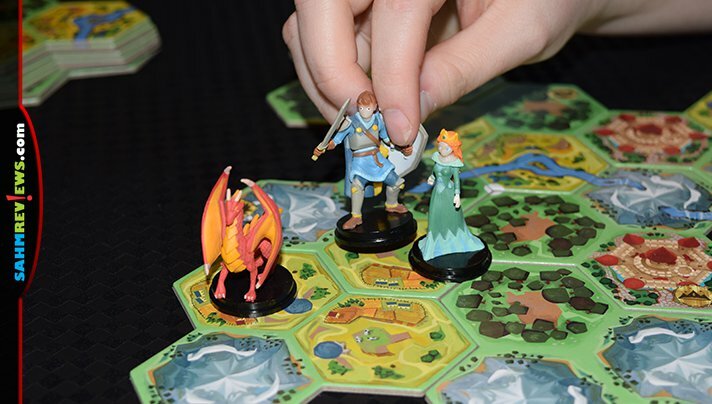 The game includes fifteen two-sided 3-hex tiles with various landscapes featured, three pre-painted characters figurines for the knight, princess and dragon, 36 Page Cards, player aid cards and four Magic Tokens. Three of the Land Tiles are specially designated starting tiles. These are placed in the center of the play area and aligned in a manner to create a tiny circle in the center. The three character figures are placed on the designated starting spaces, marked with a custom symbol. 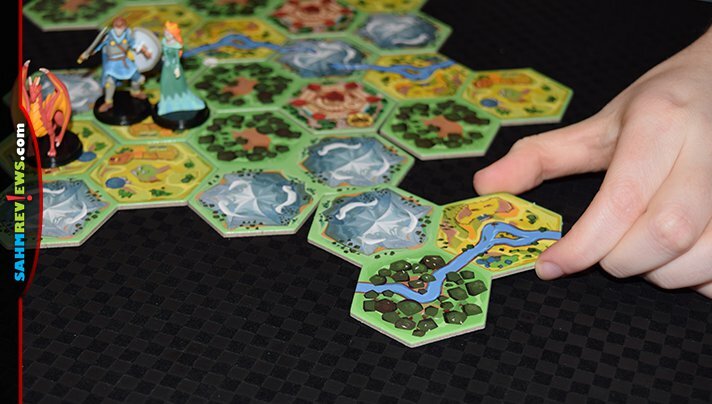 The rest of the Land Tiles are shuffled and put into a stack within reach of all players. 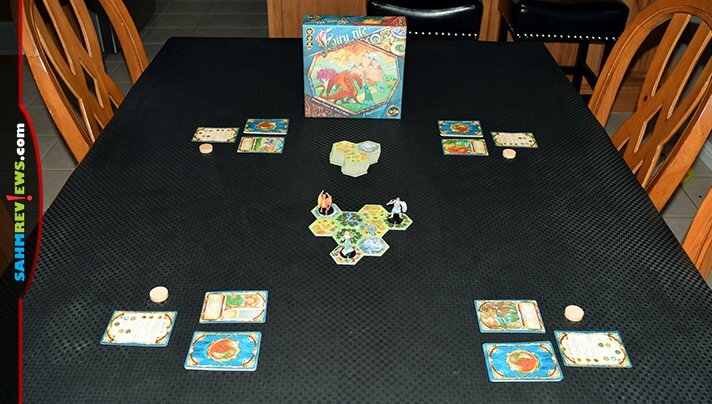 Everyone receives a Magic Token blank side up and the 36 Page Cards are shuffled and dealt out completely to all players (Fairy Tile supports up to four participants). Draw and look at the first page of your book (the top Page Card) and keep it secret. This is your first challenge to complete! A turn in Fairy Tile is very quick since you only have two choices. You can either “Develop your Story” or “Turn a Page”. 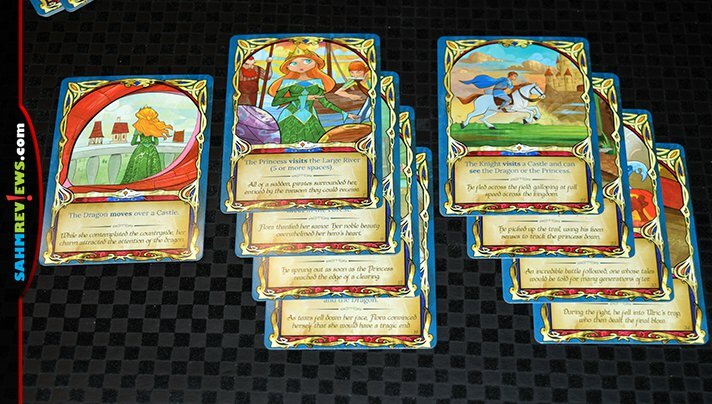 Each Page Card has a condition on it which you are trying to complete by moving the figurines on a board into a state that matches what is printed on your card. If you do not think you can complete it quickly, you may Turn a Page and place that card face-down to the bottom of your Book and draw a new one. You then turn your Magic Token over so the magic side is face-up. This allows you to take two adventure actions on a future turn! Your other option, and the main part of the game, is to Develop your Story. This opens up one more choice – either to Move a Character or Add a Land Tile. Moving a character is exactly as it sounds – move one of the figurines on the board according to the character’s movement rules. The princess moves only one hex at a time, but can also jump from castle to castle. The knight moves two spaces as long as he doesn’t end his movement on or adjacent to the space from where he began. The Dragon flies in a straight line from his starting position until he reaches the edge of the kingdom! Instead of moving a character, you might elect to add a Land Tile to the kingdom. Take the top Land Tile from the stack without flipping it over and add it to the kingdom. When placing the tile, it must be adjacent to at least two edges of the existing kingdom. Additionally, when placing a new tile, you cannot block a river’s path – the new tile must continue the river! Now you will check the board to see if you can “Recount the Adventure”. 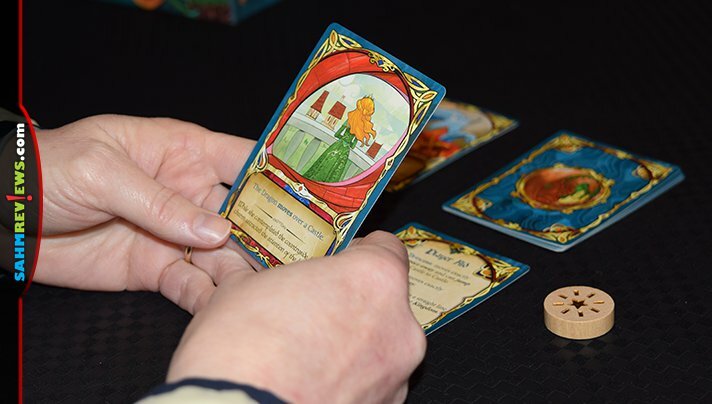 After taking your action, if the characters are in a status that fulfills the objective on your Page Card, place the card face-up next to your book and draw the next one from your deck. You now have a new objective to fill! A game of Fairy Tile ends immediately as soon as a player recounts the last page of their book. That person puts their cards in numerical order and reads it aloud! This is their custom adventure, which will certainly be different every time you play! 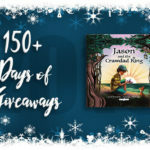 For those that didn’t finish their book, encourage them to also recount their story and write their own custom ending! You can find Fairy Tile on Amazon or at your local game store for under $30. Or you can take a chance and try to win one in our giveaway below! 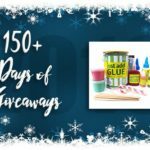 Be sure to thank iello for providing the prize by following them on social media! We recently drove cross country to move to a new city and have been exploring our new home. Traveling through the Upper Peninsula of Michigan. Last Summer I was able to drive up the Pacific Coastal Highway. It had been closed for over a year due to mudslide damage. So beautiful and should be on everyone’s bucket list. We took a cruise down some European rivers from Budapest to Amsterdam. A 36-day road trip with 2 toddlers!! My parents like to drive around and get lost, without GPS, for fun. I joined them recently. It was fun. My cousin threw up on a roller coaster ride right next to me. I went to Winter Fantasy – Tons of D&D adventures. Last year I got to spend multiple weeks in southern Germany and took the opportunities on weekends to see all the historic castles and churches. We also went to Prague. It was amazing. 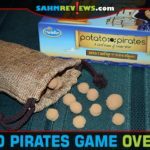 Went to PAXUnplugged last year with hubby! It was awesome!